'Superstar' Rajinikanth has recently been shuffling in between his next two highly anticipated films; Kaala and 2.0. 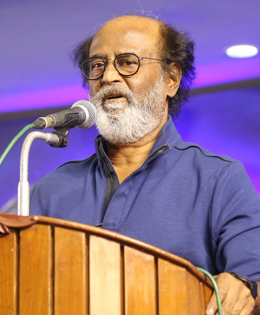 Recently, reports were circulated that the superstar will be focusing on Kaala, and then will join the sets of 2.0 for a song shoot which will take place at AR Rahman's newly built studio. Now, Rajinikanth's official spokesperson Riaz has confirmed through Twitter that, the ace actor has completed his portion of shoot for Kaala successfully. The film is directed by Pa. Ranjith and is bankrolled under actor Dhanush's Wunderbar Film banners. A source from filmunit says, “Ranjith is currently canning scenes that does not involve Rajini. He will shoot till October 15 in Chennai and after that, they will head to Mumbai to shoot the last five days of Kaala. Rajini is done with his shoot for Kaala and he will not head to Mumbai. In addition, Kaala also features Huma Qureshi, Samuthirakani, Anjali Patil and Mammootty (cameo) in important roles. Now, Rajinikanth has moved on to the final song shoot of Shankar’s magnum-opus 2.0, for which he’s appearing in a clean-shaven look. The song, which also features Amy Jackson, is being shot in AR Rahman’s newly-built studio on the outskirts of Chennai. The makers of 2.0 are currently gearing up for the grand audio launch in Dubai on October 27th, preceded by a press conference on October 26th.